This was our second year project for each student to build. 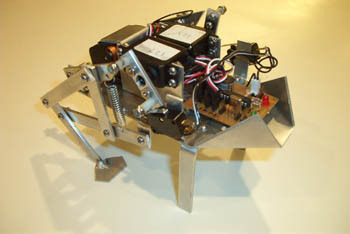 It is an aluminum hopping robot that uses a 16F84A Pic microcontroller for servo control. 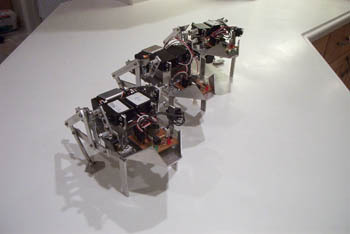 We attempted to build six Frogbots and did not get one to function properly. The major problem was the instability because the body mass being too high. The Frogbot would hop one time then fall over. A much better project to learn microcontroller programming is Insectronics.